A simple white t-shirt is an essential in my wardrobe, I wear it with anything to be honest. However do I need 7? Probably not but I swear they are all different! 2. I have way too many shoes! I have so many pairs of shoes it's unbelievable, do I wear them all? No. Maybe shoe collection would be a good idea to share my love of shoes with you all. I store my shoes in three different storage boxes, I don't even remember them all. 3. Jeans, Jeans and Jeans! How many pairs does one person need? I mean come on! 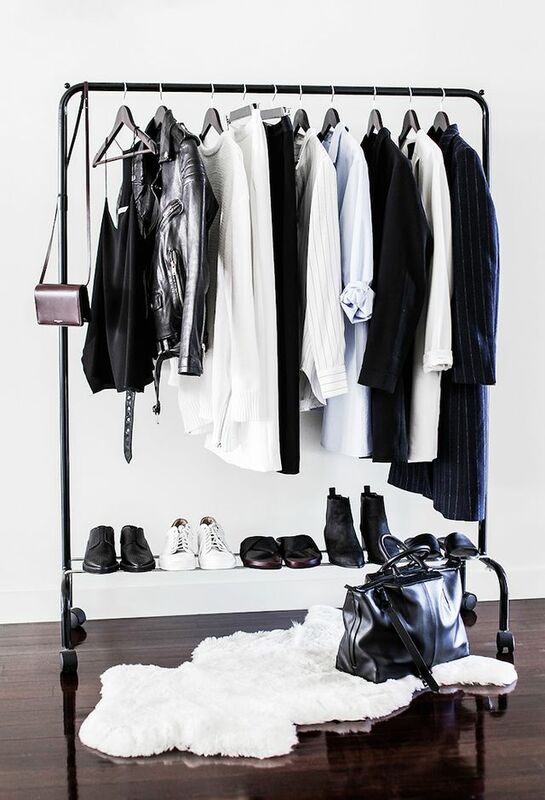 I understand your darks for autumn/ winter season and lights/whites for spring and summer. It's safe to say I've way too many and wear about a third, if not less! Also almost every pair is high-waisted, in style of Joni Jeans from Topshop. I own a lot of whites, blacks, khaki and greys with the odd navy blue here or there. I don't have anything against other colours, in fact one of my favourites colours is baby pink. However why am I lacking of colour in my wardrobe I've no idea. 5. How many sweatshirts is too many? I noticed I've a lot of sweatshirts, they're all different though I promise! Sweatshirts are just a very easy outfit to wear. I like to dress very casually whenever possible. I guess that explains my love for sweatshirts. Would you like to see a shoe collections? 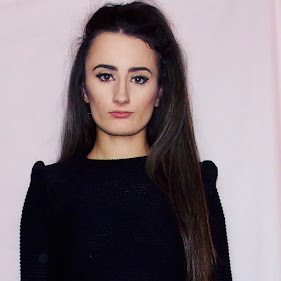 This is an outfit I recently wore for a nice meal out and few drinks with my colleagues from work. I didn't want to dress up to much but still wanted to look nice and put together. As it was very windy outside I ended up wearing jeans and a jacket to keep me warm. 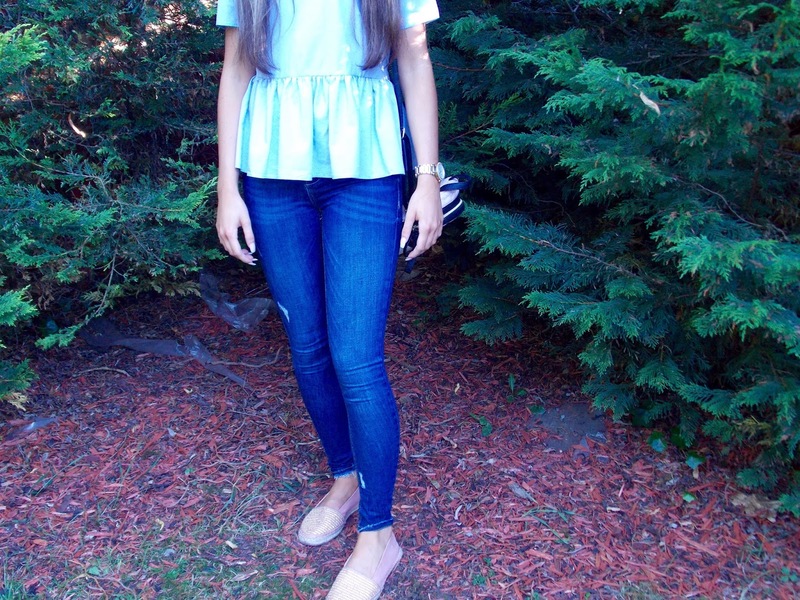 This baby blue peplum top is actually from Primark. In my opinion it actually looks like something you can find in ZARA. Also the baby blue is very in this summer. I love how nice this fits, for £8 you cannot complain. 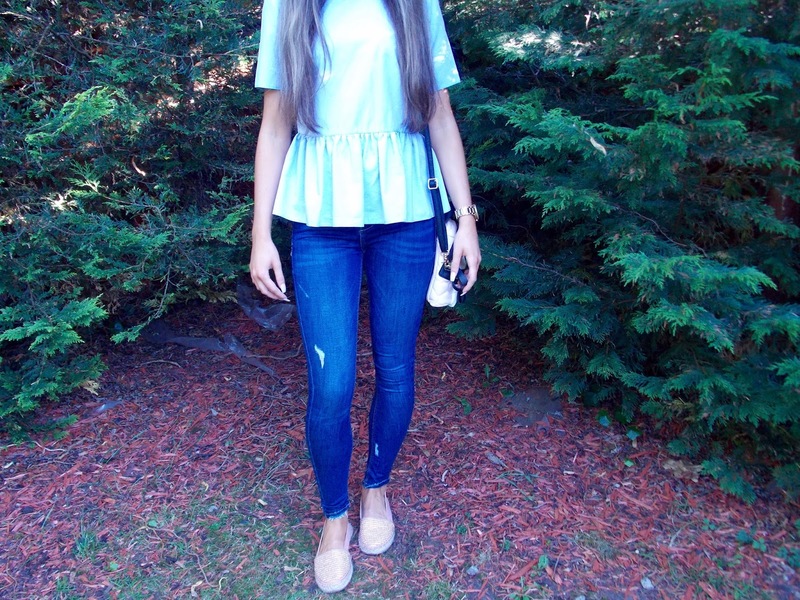 This top also washes so well, and it's very easy to iron. My jeans are from Zara, and I love everything about them. 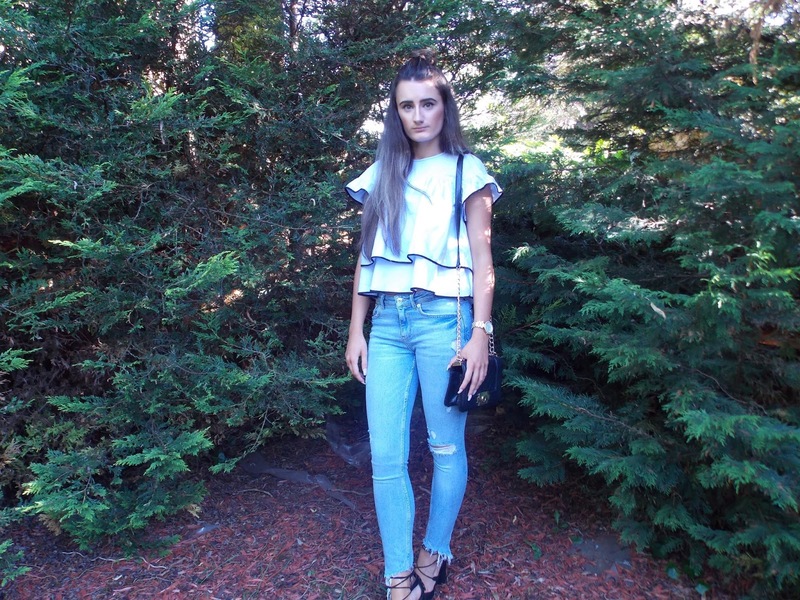 The fit of Zara jeans in my opinion is great, I am size 6 and leg 32 in Topshop if you wondering. They're mid rise like most Zara jeans, and they feel like true denim. 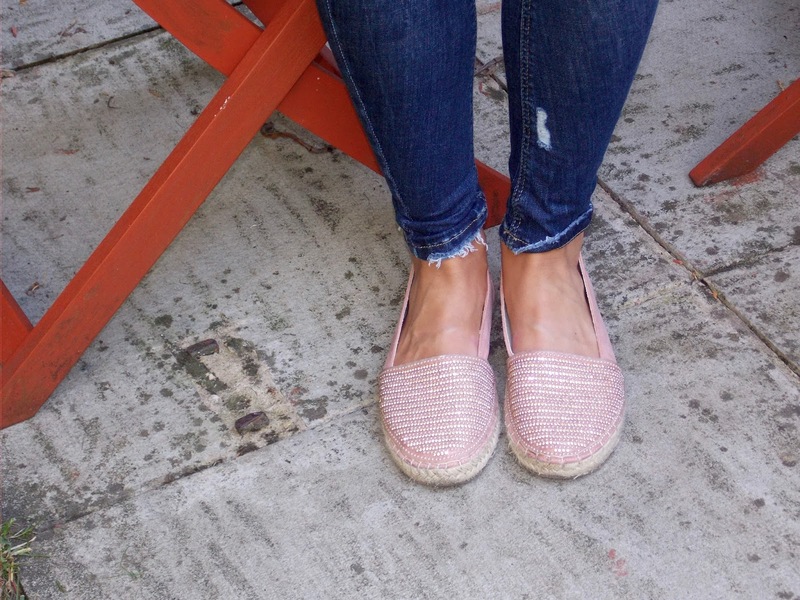 My sparkly espadrilles are from Tk Maxx and were only £12.99! What a bargain right? They are so cute but very comfortable and this same time. They match my suede biker jacker perfectly. The jacket is also from Zara, I fell in love with it as soon as I saw it. The colour is what caught my attention however it's the fit that made it buy it. They also have it in baby blue colour! 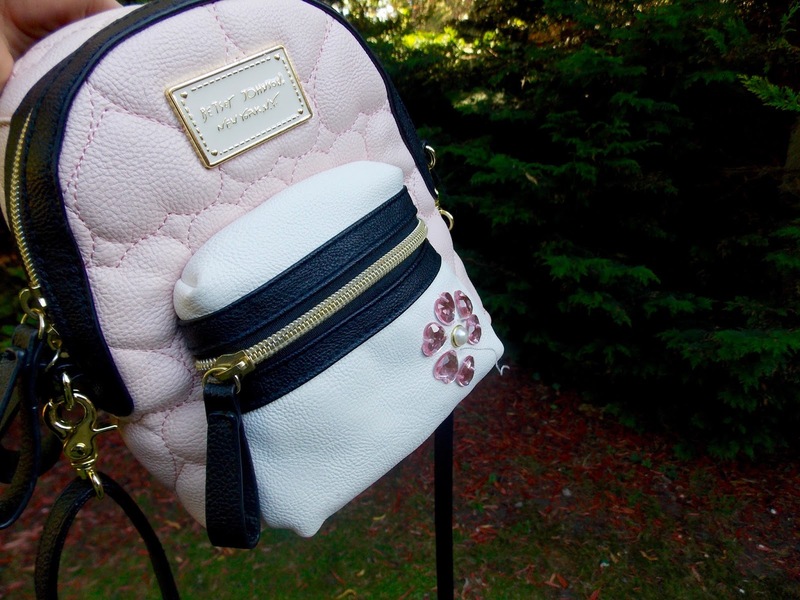 Lastly is my cute little Betsey Johnson bag, it does look like a backpack however it's a bag. Again, I got this from Tk Maxx for £34.99. I wanted a backpack however my mum said I wouldn't wear it as much as a bag, and I think she was right. This little cutie fits everything I need with me on daily basics. 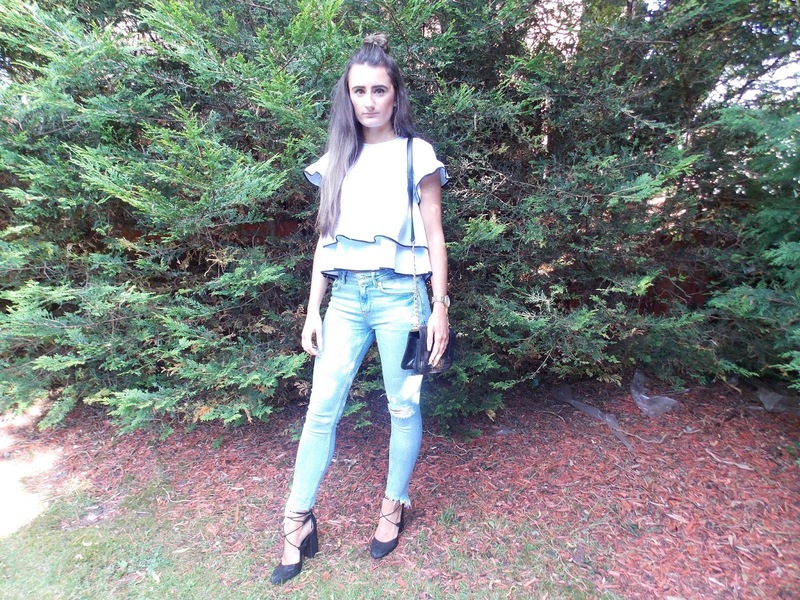 I wanted to share with you all how I style jeans on evenings out. I wore this recently on a night out to watch a boxing fight. 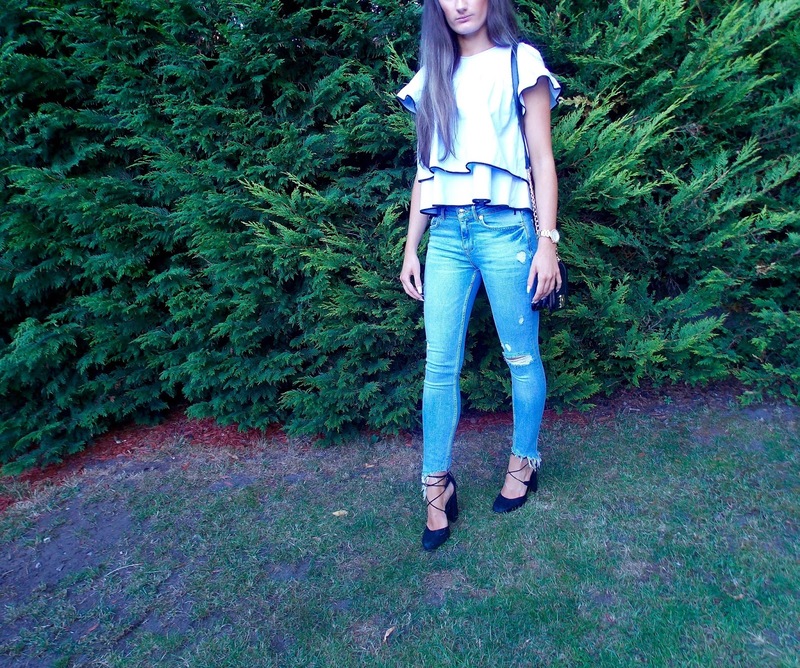 Jeans can be dressed up with heels on a night out as well as worn casually during the day. Zara has been my favourite shop recently, I am honestly in love with majority of their clothes. Both the top and jeans are from Zara spring/summer 2017 collection. The babydoll style top dresses up the ripped jeans well, matches well with my black lace-up heels which are from Bershka, last year. To be honest, I am jeans kind of girl. I don't like dresses, so jeans are my staple wardrobe essential. I like these jeans a lot because they're different. The hem line on the bottoms has fringing detail. 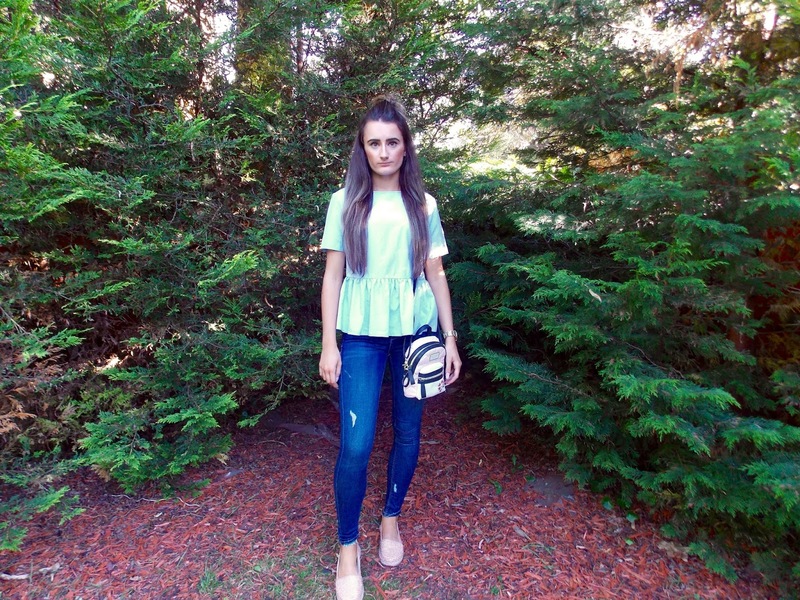 The fit of these jeans is mid-rise, I personally mostly go for high-waisted jeans because I think they're the most flattering on me. My black bag is very Chanel boy bag inspired. My iPhone 7+ just about fits, but then I don't much space for anything else.